View SolidWorks files on iPad, iPhone & Android devices! Get the Glovius app from the App Store or Google Play market. Login to your Babel3D account from within the Glovius app, and download your models. That’s it! With these simple steps, you can now showcase SolidWorks models on the go. Zoom/Pan/Rotate using the intuitive touch interface. Take sections, save & email snapshots. For assemblies, view the product structure and hide/show components using the component tree. The full feature Glovius app is available for $9.99. Glovius apps are now available for free. Glovius Lite is a free version of the app. Both SolidWorks parts (*.sldprt) and assemblies (*.sldasm) are supported. Babel3D supports other popular formats that can be easily exported from SolidWorks, including STEP, IGES, 3DS, OBJ & STL. To upload SolidWorks assemblies, zip all the files, and name the zip file as the main assembly file. For example, if your main assembly file’s name is car.sldasm, create a zip file containing all the parts and assemblies, and name the zip file as car.sldasm.zip. You can also transfer models using Glovius for Windows & iTunes. Download Glovius for Windows and the SolidWorks importer add-on. Open SolidWorks models in Glovius and click on Export on the ribbon bar. Save the .glovius file. Connect your iPad/iPhone/Android device and transfer .glovius files using iTunes. Please refer https://support.apple.com/kb/HT4094 support article for more details. Glovius for Windows is a free JT viewer with an extensible and customizable architecture. 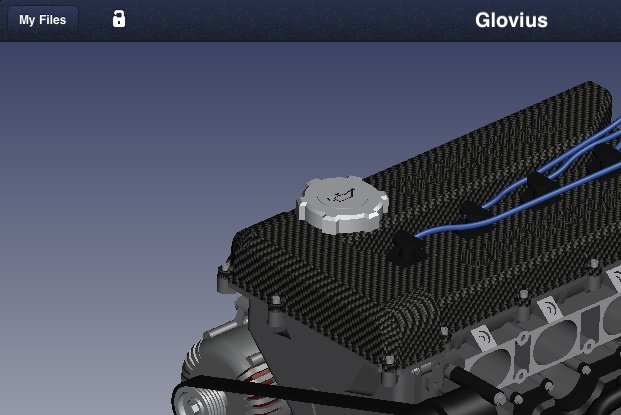 The SolidWorks Viewer Bundle for Glovius is available for $295. A free 15-day trial can be downloaded from https://glovius.com/downloads/. To purchase Glovius SolidWorks Viewer, please visit the online store.